Led by Mr Joe Wong Chi-cho, JP (photo above, 5th from right), Director of Information Services, delegation from Information Services Department of HKSAR Government visited ASTRI on 16 January 2018. Mr Hugh Chow (5th from left), Chief Executive Officer, Mr YK Li (4th from left), Senior Director, Advanced Digital Systems and Ms Eunice Cheng (2nd from left), Director of Public Affairs of ASTRI warmly welcomed the delegates and introduced ASTRI’s latest R&D, including naked-eye 3D display. Accompanied by official from Information Services Department of the HKSAR Government, Mr Omer Caspi, Director of North-East Asia Department, Asia and the Pacific Division, Ministry of Foreign Affairs, Israel (2nd from left) visited ASTRI on 21 November 2017. Dr Justin Chuang (Middle), VP of Next Generation Network, ASTRI and Ms Eunice Cheng (1st from left), Director of Public Affairs, ASTRI welcomed the delegates. They understood more about the latest development of ASTRI and they also visited our newly developed Smart City Innovation Centre. Led by Prof Theodore Henry King Clark (2nd from right of the last row), Associate Professor, Information Systems of Hong Kong University of Science and Technology, a group of around 40 students from Masters of Information System Management visited ASTRI on 23 November 2017. They understood more about the updated developments of ASTRI and experienced some live demonstrations on Smart City related projects in the Smart City Innovation Centre. Another group of students led by Prof Hang Chan (5th from right of the last row), Adjunct Assistant Professor, Information Systems, Business Statistics and Operations Management, School of Business and Management, HKUST. Led by Ms Wang Xiaochun (7th from left of the 1st row), Traffic Engineering Bidding Supervision and Management Office of Anhui Province Officer, the delegation whom participated in the training of Hong Kong Financial Services Institute to visit ASTRI on 24 November 2017. Ms Ada Lee (1st from left of the 1st row), Senior Manager, Digital Media, Public Affairs of ASTRI and Mr Vincent Hou (2nd from left of the 1st row), Manager, Next Generation Network Solutions of ASTRI welcomed the delegation. They understood more about the latest developments of ASTRI and learnt more about our Smart Mobility R&D developments and Vehicle-to-Everything (V2X) Networking System. Dr Fakhreddine Karray (2nd from right), University Research Chair Professor and Co-Director, Centre for Pattern Analysis and Machine Intelligence, Faculty of Engineering, University of Waterloo led the delegation to visit ASTRI on 24 November 2017. Dr Justin Chuang (1st from right), VP, Next Generation Network, ASTRI and Ms Eunice Cheng (2nd from left), Director of Public Affairs, ASTRI welcomed the delegates. They learnt more about the updated development of ASTRI especially in the Smart City and FinTech initiatives. They also experienced live demonstrations on some R&D projects in our newly established Smart City Innovation Centre. Mr Shi Pengfei (6th from left of the first row), Vice Counsel, Guangzhou Science Technology and Innovation Commission led the delegates whom participated in the training of HKUST Fok Ying Tung Research Institute, to visit ASTRI on 23 November 2017. Dr Meikei Ieong (5th from left of the first row), CTO of ASTRI welcomed the delegates. 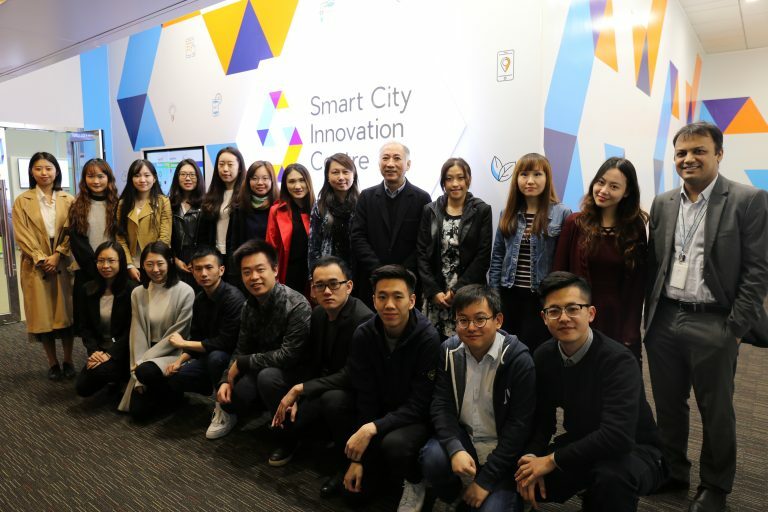 They understood more about the updated developments of ASTRI and experienced some live demonstrations on Smart City related projects in the Smart City Innovation Centre. 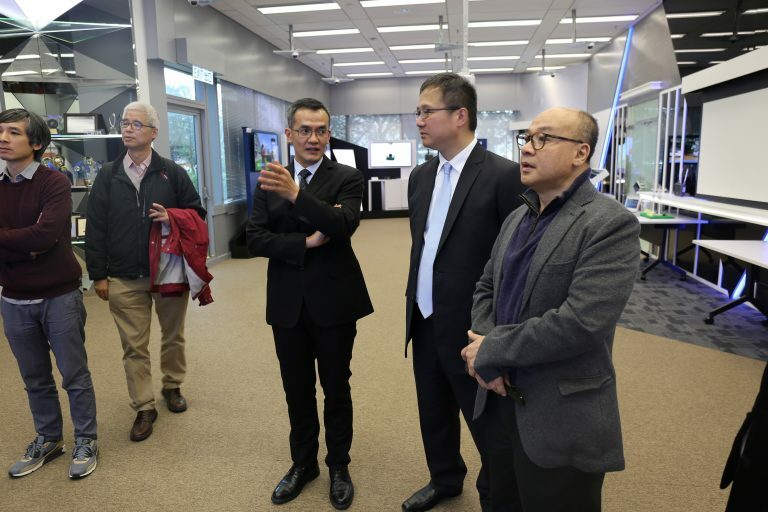 Led by Mr Cai Chao-lín (4th from left), Guangzhou Municipal Committee, Nansha District Commission Secretary; and Prof Enboa Wu (5th from left), Associate Vice-President (Knowledge Transfer), Dean of HKUST Fok Ying Tung Graduate School, the delegates visited ASTRI on 21 November 2017. Dr Meikei Ieong (3rd from left), CTO of ASTRI and Dr Chen Jung Tsai (1st from left), Acting Director, Opto-electronics welcomed the delegates. They understood more about the latest developments in ASTRI. They also experienced live demonstrations in Cyber Range and the Smart City Innovation Centre. Delegates from Mainland Government Officials Exchange Program 2017 including Mr Xi Huan (2nd from left), Deputy Director, Department of Organization and Personnel, Chongqing Science and Technology Commission and Ms Xie Minji (2nd from right), Deputy Director, Division of General Planning, Wuhan Municipal Commission of Economy and Information Technology visited ASTRI on 20 November 2017. Dr Meikei Ieong (Middle), Chief Technology Officer, representing ASTRI to receive the officials. They also met with different technology experts at ASTRI and understood more about the latest R&D developments of ASTRI in Intelligent Software and Systems, Security and Data Sciences, Electronic Components, etc. They also discussed the opportunities on collaborations in the future. Professor Gunnar Öqvist (3rd from right), Professor of plant physiology, Royal Swedish Academy of Sciences and Professor Mats Benner (2nd from right), Professor of science policy studies at Lund University and KTH-Royal institute of Technology, Stockholm visited ASTRI on 9 November 2017. Mr Wong Ming-yam (3rd from left), Chairman of ASTRI; Ms Grace Hui (1st from right), Chief Administrative Officer of ASTRI, Dr Justin Chuang (2nd from left), VP, Next Generation Network, ASTRI and Ms Eunice Cheng (1st from left), Director, Public Affairs of ASTRI welcomed the guests. They learnt more about the latest developments in ASTRI and exchanged views on future collaboration. They also visited our newly developed Smart City Innovation Centre. Coordinated by the Wing Han Education Foundation, around 40 students together with their teachers from Ping’an School, Shenzhen visited ASTRI on 8 November 2017. They understood more about the latest developments in ASTRI. 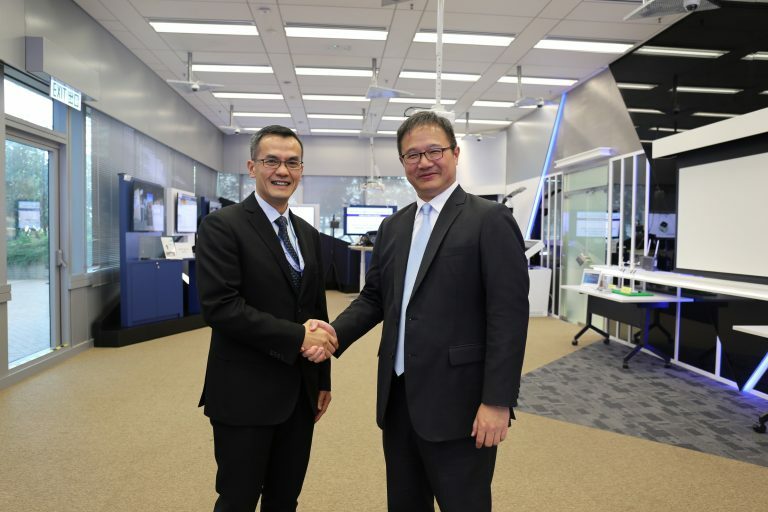 They experienced the live demonstrations on a number of ASTRI’s R&D projects, including spectacles-free 3D display and visited our newly developed Smart City Innovation Centre.